We have a fair understanding of the fundamental mechanisms that regulate star formation in galaxies, from the interstellar matter to the diffuse clouds distributed in space, whose gravitational contraction leads to the birth of stars within large stellar clusters. But observations of distant galaxies have questioned this picture, the size and mass of these distant stellar nurseries largely exceeding that of their local counterparts. An international team of astrophysicists led by the Universities of Geneva (UNIGE), Switzerland, for the observations and Zurich (UZH) for the simulations has tackled this inconsistency, which seems to question our knowledge of star formation when we study the early Universe, far away in time and space. They have found the first answers thanks to the observation of the Cosmic Snake. Their study is published in the journal Nature Astronomy. The study of star formation relies on the coordinated work of several international teams that perform observations on different scales. The Hubble Space Telescope, when pointed toward high-redshift galaxies, studies in detail very distant objects when the Universe was much younger than its present age, far away from us both in time and space. These observations have triggered an unexpected debate amongst astronomers: in the distant past, was star formation governed by different laws or physical conditions? This is what data from the Hubble Space Telescope was apparently suggesting when observations of distant galaxies revealed the presence of giant star forming regions, clumps of gas and stars attaining sizes as large as 3000 light-years, a thousand times larger than those observed in the nearby Universe. And these giant clumps, intriguingly, appeared to be ubiquitous in high-redshift galaxies. The distance that separates us from these objects prevents their detailed observation, but the astronomers have overcome this difficulty exploiting gravitational lensing, a powerful "instrument" that is offered by the Universe itself, and the laws that govern it. The telescope is pointed in direction of an extremely massive object able to deviate with its gravitational field the path of the light coming from a more distant galaxy located behind it. The light is deflected by the massive object, creating thus multiple and amplified images of the galaxy. 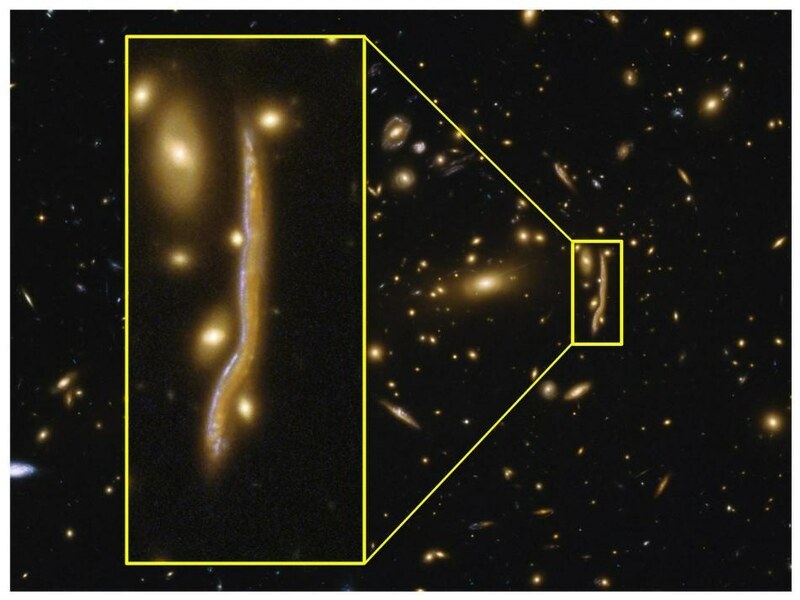 In our case, the astronomers have pointed Hubble at a huge gravitational lens, which generates several stretched, warped and almost overlapping images of the galaxy, featuring a true Cosmic Snake in the sky. «The amplified image is more precise, luminous, and allows us to observe details up to 100 times smaller», explains Antonio Cava, lead author of the study and Research and Teaching fellow in the Department of Astronomy at the UNIGE. The fact that the image of the source galaxy is repeated five times at different spatial resolutions allows, for the first time, to perform a direct comparison and to establish the intrinsic structure - and size - of the observed giant clumps. Far from concluding that different laws hold in the young and distant Universe, the international team of astronomers led by UNIGE, and including researchers from the CNRS, the Universities of Zurich and Lyon, and the Universidad Complutense de Madrid, have discovered that the giants clumps are in reality not so large and massive as suggested by previous Hubble observations, but that they are intrinsically smaller or composed by multiple and unresolved small components, something that was not possible to directly prove so far. The researchers are thus supporting the simulations developed by Valentina Tamburello from the Institute of Computational Science at UZH. Co-author of the study, she stresses that «thanks to the incredibly high resolution of the cosmic snake, we were able to compare our calculations with the UNIGE observations and confirm their match. This was an incredible luck for us." This is an important step towards the understanding of the fundamental mechanisms driving star formation in distant galaxies, even if it does not completely explain some of the observed differences with respect to local galaxies. «We have reduced the differences between what we observe in the nearby Universe and in distant galaxies from a factor 1000 to a factor 10», stresses Daniel Schaerer, professor at the Geneva Observatory. He also points out the compelling convergence of ground-breaking observations and sophisticated state-of-the-art simulations, such as those developed by the UZH collaborators, which suggest that the remaining differences can be explained by the turbulent nature of the distant galaxies.